Found drifting on the surface of tropical and subtropical oceans, the Portuguese man-of-war (Physalia physalis) has evolved adaptations for moving, capturing prey, feeding and reproducing. In spite of looking like a jellyfish, the Portuguese man-of-war actually belongs to a related family, the hydrozoans, and is made of hundreds of organisms grouped together. A 6-inch pink or purple float joins together tentacles that extend to 10 to 30 feet, but can grow as long as 165 feet. The Portuguese man-of-war is a colony of cooperating organisms called polyps. Four types of polyps make up a single individual -- a float, capturing tentacles, feeding tentacles and tentacles for reproducing. The float is a single, translucent organism, standing 6 inches above the surface of the ocean. Tentacles hanging below it include capturing tentacles containing stinging cells full of tiny, coiled, stinging barbs. Eating tentacles lead to mouths with bag-like stomachs along the underside of the float, and are covered in cells for touch and temperature. Man-of-war reproducing tentacles are made of tiny sacs containing male or female cells. Capable of little purposeful movement, the Portuguese man-of-war float helps it disperse throughout the ocean. Without any way to propel itself, it drifts according to the current and wind direction. Individual floats lie either on their left or right side, so when the wind blows, right-lying individuals move at an angle of 45 degrees to the left of the wind direction, and left-lying individuals do the opposite, which helps disperse them. The Portuguese man-of-war float also can rock from side to side to keep itself wet all over, and deflate and submerge to avoid attack from above. Capturing and feeding tentacles on the Portuguese man-of-war have adapted responses to contact with prey. Capturing tentacles expel their stings on contact with a foreign organism and the stinging barbs paralyze prey with a powerful toxin. Feeding tentacles grab the paralyzed creature and lift it to a mouth, from where it passes into a stomach filled with digesting enzymes. Nutrients from the digestion process eventually spread throughout all the man-of-war's polyps, and the mouth expels any undigested material. Fish make up 70 to 90 percent of the man-of-war's diet; it also eats shrimp and other crustaceans, and other small sea animals. It doesn't attack humans, but people who accidentally come into contact with its tentacles receive a painful sting. The Portuguese man-of-war reproduces in fall, releasing egg or sperm cells into ocean water. Individuals are either male or female, and reproducing tentacles develop sperms or eggs on the surfaces of their cells. Spawning, or releasing eggs and sperm, probably takes place when there is sufficient density of individuals present, according to the University of Michigan Museum of Zoology. Larvae then grow into a new colony of polyps through budding, or asexual reproduction. 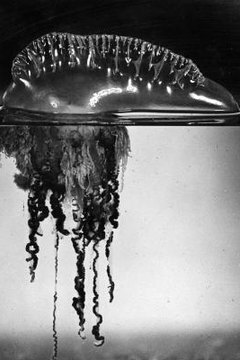 The Atlantic Ocean is probably the site of man-of-war reproduction.